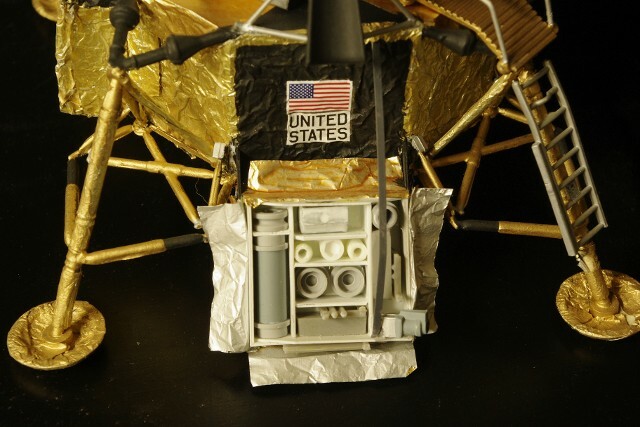 1/48 scale modified Monogram "First Lunar Landing"
Apollo 15 mission - "First Lunar Rover"
This version of the Monogram kit was built to depict the first mission to employ the Lunar Roving Vehicle - Apollo 15. 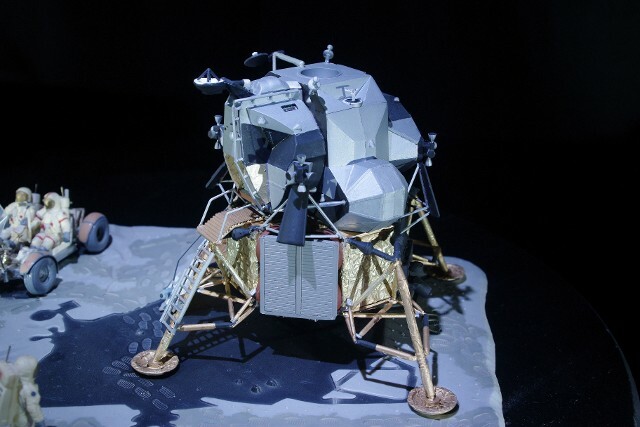 The Lunar Module was LM-10, which was the first "J Series" LM built and moved up in the flight order to accommodate NASA's need to get more science out of the last three lunar landing flights. The J Series provided more decent propulsion power, more surface consumables, larger surface experiment storage and room for the Rover. The base was re-painted to provide the appropriate shadows. The crew is in position to deploy the Rover. The lanyards they pulled to set off the deployment sequence are yet to be re-done. 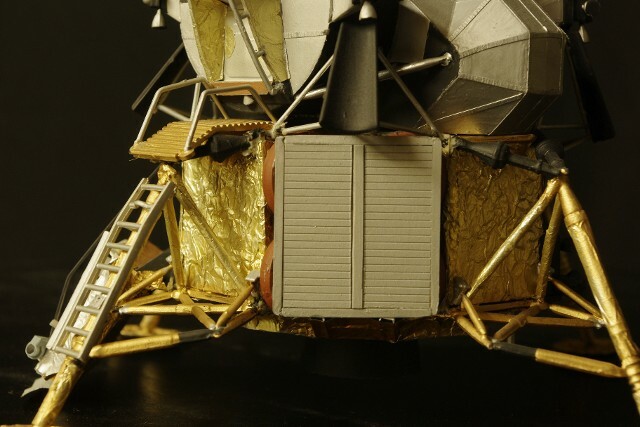 The original "folded Rover" was made from balsa wood and did not hold up well over the years. 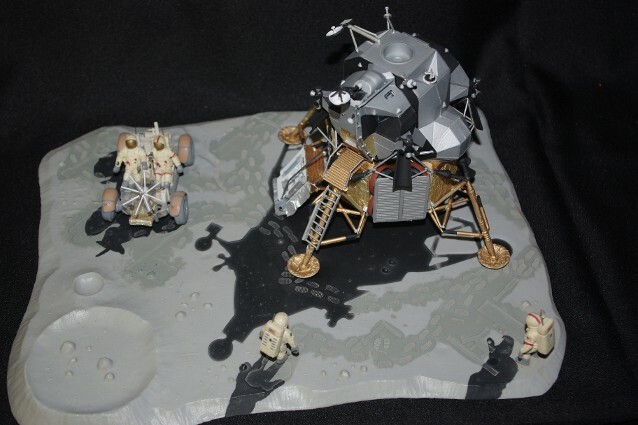 When we we did the LM details, including SMS decals, we built a new folded Rover, using plastic sheet stock and I-beams. A far sturdier and realistic looking component. The driven Rover is the original scratch-built Rover, except for a new clear plastic sheet formed high-gain antenna. 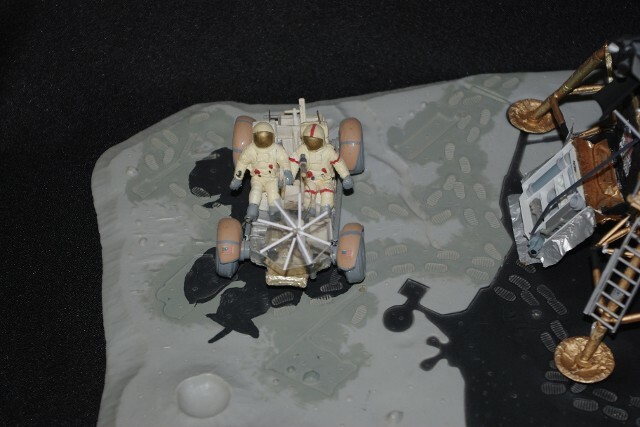 A close-up of the scratch-built Rover. The fenders were made on a Mattel "Vac-U-Form" toy many, many years ago, as was the original high-gain antenna. The antenna needed replacing, but the original fenders are still there. 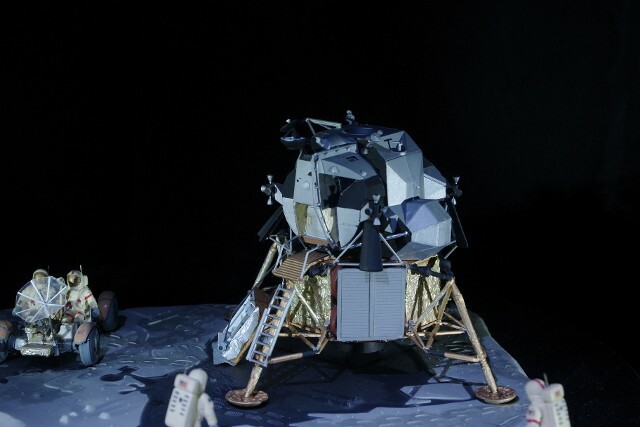 The "MESA" (modular equipment storage area) was also re-done in plastic stock, with new "tools" created from spare parts, and the TV camera mounted at the lower front corner. 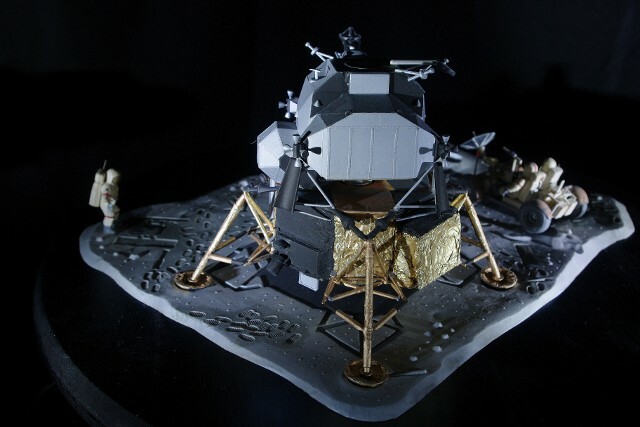 A close-up of the LM, showing the rendezvous window, improved docking target and EVA handrail along the Nose" of the Ascent Stage. 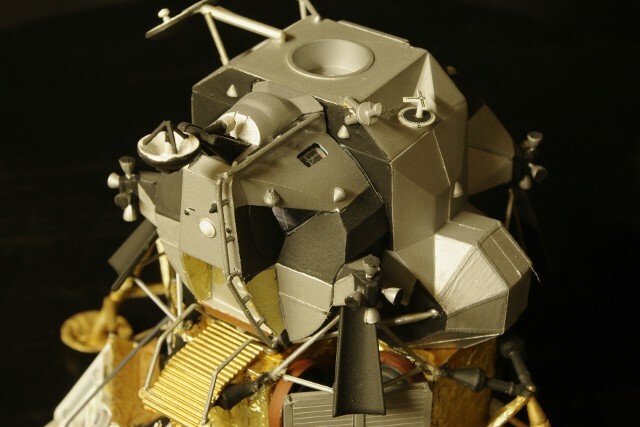 The Rendezvous radar was re-oriented to appear as it did on the Apollo 15 LM.